Please forgive the long silence, this year has been incredibly busy for me but that is no real excuse for my absence! January saw the 50th anniversary of the United Church of Zambia rapidly followed by the general election which was won by Edgar Lungu returning in the Patriotic front party. The election was caused by the death of Michael Sata, just 2 days after Zambia celebrated its own 50th independence day on 24th October 2014. I was privileged to host Rev Graeme Halls who was representing the Methodist Church at the UCZ celebrations. We attended the 50th anniversary commemoration service in Kitwe on 16th January in the original church at Mindolo where UCZ was formed, and had their very first service. 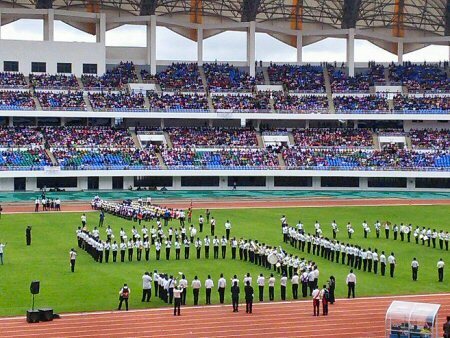 Then on 18th We were at the main National Football stadium in Lusaka where acting presidents, former presidents and presidential candidates rubbed shoulders with pop stars and UCZ dignitaries as they were entertained by marching bands, choirs and speeches during a church service for over 10,000 people. The band spells out 50 for the UCZ jubilee at the national football stadium on 18.01.15. We also managed to fit in a visit to play4all which is still thriving despite the break ins. (We are no longer bothering with a door just a grill gate!) Jane, the project manager is doing a great job drawing objects and letters on paper plates and making other low Tec games to help the children develop those all-important pathways of learning. 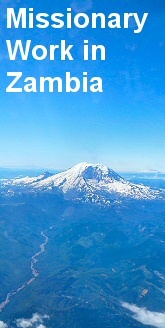 Please check out the website, it is well worth a visit and the more hits we get the better, just click on play4allzambia.org. We also have a new minister at St Stephens, Rev Oscar Musonda who came in January, and has greatly improved the midweek meetings which now average at 40 – 50 people. The manse is almost finished and soon there will no longer be need to rent a house for him. My life has been taken up this last few months with the challenges we have at Chodort. CHAZ (Churches Health Association of Zambia) were providing funding for 15 vulnerable youth on a 3 year agreement but had to curtail it because their money from the Global fund was withdrawn. This left us high and dry with 9 young carpentry students and 3 tailoring who were unable to pay fees because of extreme poverty. These young adults stand little chance of getting out of poverty unless they learn useable skills so we kept them on thinking we could have some students from families who can pay fees. 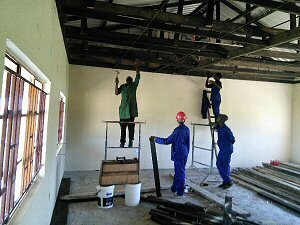 This year Choma Trades Insitute begins a 5 year grant from the Africa Development Bank Fund and offers classes at 1/10th of our price, leaving us without any income from the carpentry class. 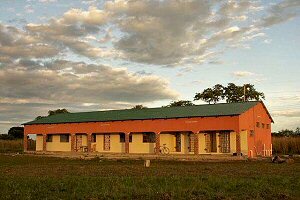 It was virtually impossible to find someone to subsidise in Zambia, but I am pleased to say that funds for about 9 of the 12 student fees have come in from churches in Scotland and England who knew about our situation. A big thank you to them. Another blow was that our most lucrative classes, the computer class are down to 75% occupancy for the first time ever. Despite strong advertising for the next batch which begins in July, the trend looks as if it may continue. According to our 2015 budget projections I have to find around £20,000 to balance the books this year, (so lack of students & accompanying fees is not a good start!) but am very encouraged by our income generation projects which both seem busy. Royda has finished 130 school uniforms for Masuku, and is making 50 days for girls packs to go there too. We also have Vicky Williams with us for 2 months to do marketing and hope that will help improve our businesses’ to counteract the losses on training and the administrative expenses side. Please look at her blog it will give a good flavour of her experiences over here. 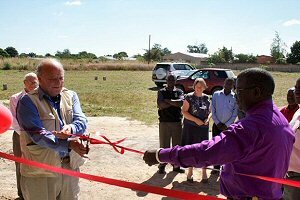 April saw the completion of the new classroom block and a visit from Sir Alan Munro the chairman of the Beit Trust who gave the grant to complete it. We are still trying to furnish the classrooms so we can use them as soon as possible. Our Carpentry have turned a K96,000 loss in 2012 to a K28,000 profit in 2 years. Well done Peter & the team! With a grant from our friends in Dortmund and using the profit from our housing estate, we have been able to raise the wages of 15 staff by 40% to bring us in line with government minimum wage guidelines. Thanks for a peaceful transition of governments, despite posturing and bad feeling before the elections. For our beautiful new classrooms. 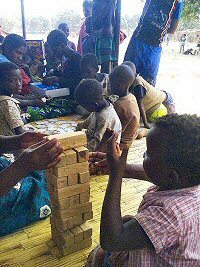 That Play4all has a great website, and that Jane Mwenda is running the project really well despite having minimal support from me. That we will get help funding the remainder of our vulnerable students this year and into the future. For an improved marketing strategy to help us become financially independent. For wisdom and insight in the decisions we make about the use of the new college classrooms. For the success of the celebrations in October when we have the grand opening of the classrooms with visits from Rev Nixon (former principal) and Mr Kirkpatrick (architect) from Ireland and a small delegation from Germany.